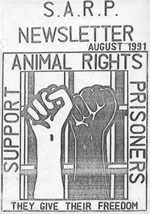 Support Animal Rights Prisoners newsletters: Year One. 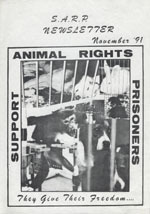 After a brief existence and quick demise in the 1980’s, the Support Animal Rights Prisoners organization was re-founded by Barry Horne and some friends in 1991. 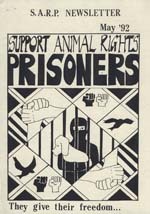 At the time Barry was imprisoned for possession of incendiary devices, but he never let incarceration keep him from participation in the movement. So, using a prison typewriter, he set to work writing the SARP newsletters. 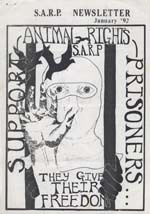 There are claims in the first issue that the material in SARP was written by a committee of five volunteers, but information we have received from reliable sources suggest that in actuality Barry wrote every issue of SARP except for the final issue, which was written by ALF Press Officer Robin Webb. Barry was one of the most dedicated activists our struggle has ever known, but it would be a disservice to him to strip him of his humanity by pretending that he was without error. 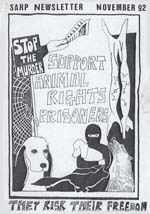 There are some poorly examined ideas in the pages of SARP that deserve measured critique, most especially that animal rights activists must, in all instances, preserve “unity.” Calls for unity are often used by those guilty of the most destabilizing behaviors as a way to avoid criticism for their own complicity in pushing people apart. 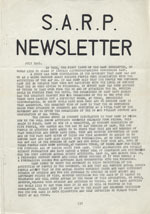 During the era that SARP was being published there were concerted efforts by organized racists to join the movement, for car and postal bombings to be supported, and so on. Under such conditions total unity wouldn’t exactly be a good thing, right? 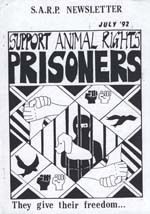 But for every weak idea presented in the pages of SARP, there are also beautiful moments that give voice to our imprisoned comrades, that remember our dead, and that call for nothing less than a revolution to liberate non-humans from the tyranny of the human species. Barry wrote with an intensity and single minded dedication that reminds us of just how precious each second spent fighting is, and how we must stop wasting those ticks of the clock. To Barry, life, and even death, should be utilized battling the scourge of speciesism. 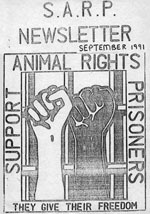 These newsletters are Barry’s voice ringing out from decades past, telling us to ACT NOW in solidarity with the animal nations. 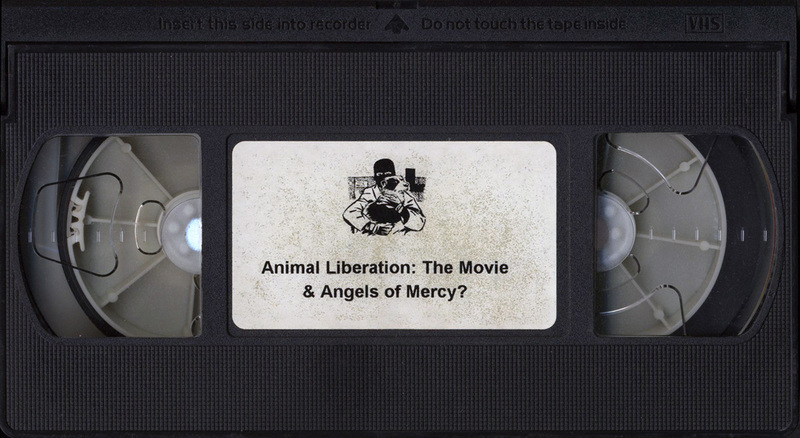 In 1995 Channel 4’s Warcries news program aired Angels Of Mercy?, a 30 minute investigation into the Animal Liberation Front. 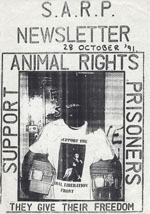 The show focused primarily on Keith Mann, an ALF volunteer who was then serving England’s longest sentence for animal rights motivated arson. While most commercially funded news has a clear bias in favor of the status quo (and the channels sponsors,) Warcries was known for fairer journalism. The result in this case was a surprisingly sympathetic look at what pushes a young person to commit criminal acts on behalf of non-humans. Given developments since it first aired, it also serves as a remarkable lesson about public credibility and how difficult it is to regain once lost. 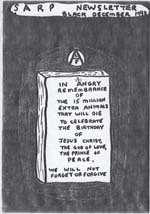 In the 1990s our movement had a variety of articulate, savvy spokespeople, and the release of Angels of Mercy? quickly made Keith Mann foremost among them. His voice-overs from a prison phone are heard over shocking footage of animal abuse, and interviews with his family and supporters act to assure the audience that he is a rational and passionate activist working to stop what can only be described as horrific cruelty. 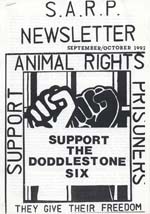 When Keith was later released from prison he was highly sought after as a speaker and a source for reporters. I always felt reassured when I saw his face in the news since I knew it meant that at least one positive quote would make it’s way to the public. 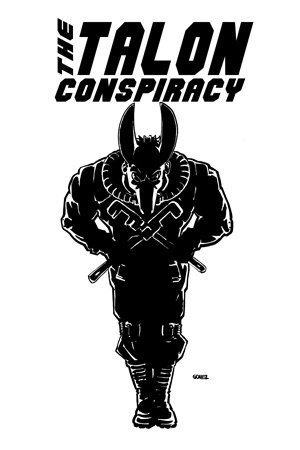 Sadly, in the last few years Keith has become a devotee of British new-age guru David Icke, a man who believes that a race of reptilian shape-shifters secretly controls the world, that cancer is a fungus, that some humans are actually half-dead, inter-dimensional beings, and a host of other pseudo-scientific nonsense. After being literally laughed off of television in 1991 when he wrongly predicted the end of the world, he has resurfaced in recent years as a lecturer and author with a depressing number of followers. Since his conversion to odd-ball conspiracy theorist Keith Mann has lost much of his credibility both inside and outside the movement. Most recently he has become a holocaust denier, thereby severing his ties with many of us who still held some hope that he would come to his senses. It’s a shame, because as I watch Angels of Mercy? I am reminded of the rare power he once had to make everyday people understand direct action and animal liberation, a power whose benefit is now lost to the animal nations. It is my hope that by posting this video others will consider how desperately the animals need trustworthy advocates, and how easy it is to damage that trust.